Kidlet has gone to the same school since Kindergarten. That makes 6 years! One tradition we have always enjoyed is the end of the year family picnic. Now this is our last one! *sniffle* It's so weird to think that things we have been participating in for 6 years will soon no longer be! Now I have to spend the last few weeks of school trying very hard not to cry lol. Today Kidlet and I will be sharing this fun picnic lunch. pb, jelly and PRETZELS?? You might be onto something here! Sounds delish!! Looks yummy! And I love this lunchbox! 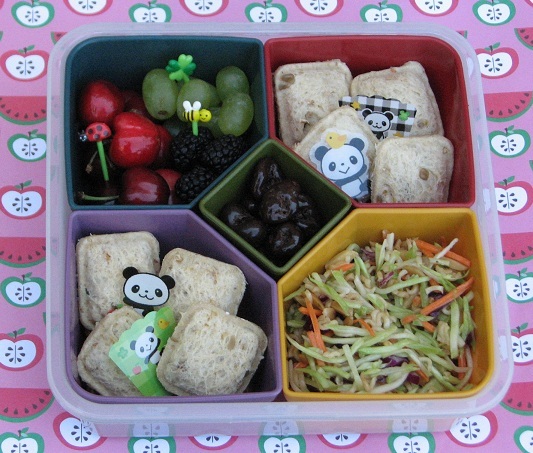 Pocket sandwiches looks so neat and I love the bento box that you used!